Click here to hear a Toadfish! Toadfish, top, have traveled aboard the space shuttle for research. Atlantic sturgeon, center, have nearly disappeared from the Bay over the last century. Rockfish, however, have rebounded in numbers over the last decade. Circle hooks, like the one at bottom, help lower mortality in catch-and-release angling. When you get to know one of Chesapeake Bays 300 fishes, you may discover theres more there than makes a meal. I, myself, caught a lovely silver fish the other day. My first fish ever, a 19-inch rockfish. It didnt speak to me, but it did move. It breathed. It looked into my eyes. And then it hit me. No, not the fish, but that the fillets I had been eating all these years might come from an underwater world similar to my own. Why do I sound so shocked, you ask? Because if you asked me  before this summer  to describe fish, Id not take too long to respond with a pat on my tummy, a lick of my chops and a drooling declaration of delicious! Ask me now, and youll hear something different. 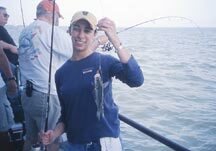 All it took was my first fishing trip aboard Captain Jim Brincefields Jil Carrie on the Chesapeake Bay. I spent the day casting with veteran anglers Edward Murdy and folks from Marylands Department of Natural Resources, who also pulled in their fair share of rockfish. I realized then and there that the rockfish dangling before me was just one unique individual among hundreds in the Bay. What kind of life did I pull him from? What personalities would he have encountered had he not been hungry enough to dine on the razor clam hooked to the end of my line? Who else is down there that may have meandered past my bait, fins propelling them toward a different fate? Ive spoken with the people who, together, share a kingdom of wisdom about the Bays fishes  whether theyve spent a lifetime fishing the Bay, have made the Bays ecosystem their focus of study and career or have written of the Bay. As it turns out, they tell a story of the swimming personalities of the Chesapeakes waters not unlike the bipedal personalities we encounter on land. Or its bulging eyes, fleshy whiskers and flat head. The Oyster Toadfish, Opsanus tau, while not Bay-belicious, is one Bay personality that Edward Murdy believes is much maligned and deserves special mention. Murdy should know. He wrote the book Fishes of Chesapeake Bay, at least its newest edition. But no bother, because youre better off sparing this belligerent yet doting miscreation than making him your meal. The male toadfish is a regular Mr. Mom. Hes there for his kids before theyre conceived and will parent for up to four weeks after his toadlets hatch. Mr. Toad prepares an isolated nest for his precious little darlings-to-be on the Bay floor  often from old tin cans  making sure the eggs stay out of the sights of predators. Infamous for his singing voice, the male toadfish serenades spawning females with the foghorn sound he produces in his swim bladder. Using the fastest pair of contracting muscles of any animal, he sings until a female finds her way into his nest to lay her eggs. Mrs. Toadfish orphans her eggs  the largest of any Bay fish species at about half a dimes diameter  and leaves the male to fertilize them after she swims off. Father toadfish not only stays put to egg-sit; he cleans, too. The male toadfish keeps a tidy home, regularly removing debris flowing into the nest that he protects. Even after the young are free swimming, the male guards his flock, harboring them within the nest as they swim in and out among his fins, says Robert Lippson in the bible of Bay life, Life in the Chesapeake Bay. The toadfish resumé expands beyond fatherhood into rocketry. A NASA shuttle mission using the toadfish has made this Bay resident the most traveled, taking it from the depths of its natural habitat  the western Atlantic from Maine to the West Indies  to the reaches of outer space. In November of 1998, two toadfishes off the coast of Massachusetts joined the ranks of Alan Shepard, Neil Armstrong and Buzz Aldrin. Joined by Sen. John Glenn of Ohio and five astronauts, the two toadfishes traveled three million miles through space as part of a follow-up for an experiment conducted earlier that year. Its broad, flat head proved to be an anatomical advantage over other fish. Experimenters find ample space for neural wiring within Opsanus disproportionately spacious brainpan. While many fellow watermen and anglers may agree with Captain Jim Brincefields conclusion that the nasty-toothed, bait-stealing, no good critters are as ugly as they come, theres no denying that the toadfish has proved himself a dedicated father and a valuable resource to science and medicine. Bluefish, top right, will bite anything in sight, including you. Perhaps the only brave soul willing to try his tongue at the revolting toadfish is the bluefish, Pomatomus saltatrix  the Bays mean, lean, eating-machine. Theyre hungry, impulsive and looking for adventure or whatever comes their way. Since alls fair in dinner and dessert, even human bathers should beware: Gills are not required to make it onto a blues menu. This garbage disposal disguised as a fish may consider your submerged body fair game. Blues are so insatiable, that they have been known to eat so much that they cant eat anymore and then regurgitate what theyve eaten for the express purpose of eating more, says Department of Natural Resources fisheries biologist Martin Gary. The large-mouthed bluefish attacks and devours victims with sharp, triangular teeth. The upper jaw accomodates a second, inner series of chompers to get the job done. Blues, which reach lengths nearing four feet, cruise in schools of like-sized fishes. Packs of these underwater hells angels, known for their wanderlust, roam waters of the western Atlantic from Nova Scotia to Brazil. Theyve been spotted in the Mediterranean, Black Sea and the Indian Ocean. Right here at home, your best chance of catching a blue is from spring until autumn, especially in July when they reach their peak spawning levels in Chesapeake Bay. The fighting spirit of blues makes the Bay a popular attraction for anglers looking to encounter this predator who, occasionally, when hooked, will make spectular leaps out of the water, says Brincefield. Commercial landings of blues from the Chesapeake account for 20 percent of the national commercial fishery, but their recreational catch as a sportfish of the Bay is five to six times greater. So, the next time youre out fishing Bay waters on a balmy summer day, stay alert, for you might end up enjoying quite a fight. But hold off on that dip. 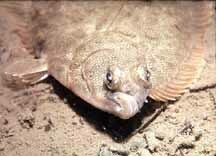 Flounder, like this winter variety, come left-handed and right-handed  depending which side of the body the eyes have migrated to. Are you a lefty or a righty? If youre a flounder, that depends on whether you set your sights on the Chesapeake come winter or summer. Rookie anglers may consider these seasonal visitors to the Bay flatfish twins, but experienced anglers know better. Summer flounder are aptly referred to as left-handed  bearing both eyes on the left side of their heads  whereas winter flounder are right-handed  bearing both eyes on the right side of their heads. Why the two flounders eyes and seasonal migrations are related remains a puzzle yet to be solved. The summer flounder, Paralichthys dentatus, vacations in the Bay from spring until autumn when it heads offshore to deeper and cooler waters for the winter. Underwater, the myth holds true: leftys are sinister. Small fishes, squid, seaworms, shrimp and other crustaceans who fall prey to the summer flounder will vouch for that. Summer flounders adapt to their environment and use their body to blend in. Theyre flattened evolutionarily and can change color  if they go on a light sandy bottom, they can turn almost whitish, says Gary. The flounders Houdini act is also its meal ticket. Theyre sneaky little buggers, says Brincefield. They lay in wait for their prey on sandy flat bottoms or sandy drop-offs and bury themselves in the sand, except for their two little beady eyes, which stick up out of the sand. When their prey swims past they come out of the sand and whack it! Unsuspecting traveler goes from swimmer to snack in the blink of a left eye. The winter flounders one of the few marine fishes to overwinter in the upper Bay, but summertime sends this upper-Bay enthusiast searching for deeper waters offshore. If the cold of the season wont hold you back from trying to catch a winter flounder, the fish themselves may because theyre more challenging to catch with a hook and line than the summer flounder, according to Brincefield. And, unlike the summer flounder  which has a large mouth, strong jaws and prominent and pointed teeth  the winter flounder, Pleuronectes americanus, has a small mouth with small teeth that are only on the left side of each jaw, making this flatfish not quite as menacing as its warm-weather counterpart. Capt. Jim Brincefield, left, and a happy client show off a trophy striper. 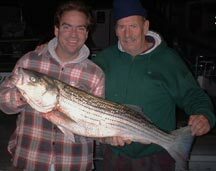 Chumming for rockfish as we did the day I reeled in my first striper, I wouldnt have always struck it big. Curiously, some fish are better off today than when I came here, but more are much worse off, reflects Bill Burton, who  having cast his first line into the Chesapeake in 1956  caught his first Bay striper 47 years ago. Back then, catching striped bass was easy and hauls were enormous. In 1973, fishing vessels groaned beneath the hull-cracking 14.7 million pounds caught commercially in the Chesapeake Bay. Just 10 years later, the same vessels docked with a smooth-sailing load of only 1.7 million pounds. Sighs of relief for boats, disbelief for watermen. What accounted for the 88 percent decrease? Loss and alteration of habitat, overfishing and pollution according to the U.S. Fish and Wildlife Service. Maryland and Delaware put all striped bass fishing vessels and rods, commercial and recreational, to rest for five years beginning in 1985. Virginia finally joined in 1989 with a one-year moratorium on striper fishing. Relieved from rod, pound and gill net and haul seine, rockfish recovered to where theyd been before watermen and anglers went overboard. Rockfish vessels awakened from their slumber in 1990 when all moratoria were lifted. The mid-Atlantic striper fishery  formally declared restored in 1995  has set size, catch and length-of-season limits ever since. The comeback of the striper represents one of the greatest stories of a Bay fishery. In that regard, it gives us hope for many of the fisheries, says DNRs Peter Tango, whos been fishing Bay waters for more than a decade. Atlantic sturgeon can weigh up to 800 pounds and grow to 15 feet. The Atlantic and shortnose sturgeon  whose family dates back to the days of dinosaurs  are more than a buck and a vote shy of enjoying the same prosperity as their prehistoric ancestors. Both sturgeons  which appear to wear their skeletons outside of their bodies  are characterized not only by their bony rows of scutes running from head to tail. They are also both scooting on the edge of existence after 150 million years of life on Earth. In Maryland, the Atlantic sturgeon hasnt spawned for decades, according to Karl Blankenship of the Bay Journal. It was hardly an act of self-nomination in 1988 that landed the Atlantic sturgeon on the Candidate Species List, the ominous title preluding an animals passage into the endangered zone. The Bay fish longest in tooth and torso, the Atlantic sturgeon can live to 60 years, reaching lengths of 15 feet and weights of 800 pounds. The sturgeons size, though, has been no match for human appetite. Since colonial times  when Captain John Smith reported there were more sturgeon than could be devoured by dog or man  humans have hungered after Atlantic sturgeon for their savory roe and flesh. Caviar cravings commanded the 700,000 pounds of the fish that Chesapeake vessels hauled on board in 1890, the fisherys peak year. A short 30 years later, our insatiable appetites had devoured most of the Bays stock of Atlantic sturgeon. Full stomachs meant commercial landings that were three percent of what they had been. Fishermen couldnt even muster 23,000 pounds in 1920. In 1996  to preserve this prehistoric creatures present-day status  Maryland shut the door and turned the lock on its sturgeon fishery. That same year, Marylands Department of Natural Resources Fisheries Service, the U.S. Fish and Wildlife Service and the Chesapeake Biological Laboratory unlocked a joint effort to revive Atlantic sturgeon by rearing hatchlings in nurseries and by setting strict catch limits. Two years later  to help seal a more favorable fate  the Atlantic Marine Fisheries Commission pulled the plug on all sturgeon fishing along the entire Atlantic coast for four decades. The Atlantic sturgeon has, so far, managed to outrun the endangered species list, but its cousin has fallen behind. The U.S. Fish and Wildlife Service in 1967 designated the smaller and shorter-lived shortnose sturgeon endangered. The shortnose sturgeon once rendezvoused in the Potomac and Susquehanna rivers and other Chesapeake Bay tributaries, but by the early 1900s its gallivanting in Bay waters had slowed to a crawl. Commercial fishing for the Atlantic sturgeon all but plucked our local waters dry of the fish, which was commonly mistaken for its tastier cousin. Now that fishing pressure has been removed, the U.S. Fish and Wildlife Service says that water quality and access to spawning grounds will ultimately decide both sturgeons futures. A future that, at the moment, is as unclear as Bay waters. Leave it to the experts to get sturgeon to their spawning tributaries, but dont leave it to others to work for a healthier Bay. You can help keep other fishes from slipping into the endangered zone. 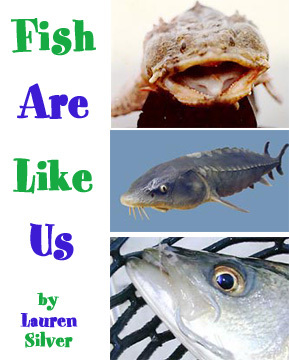 Fish are like us. They like comfortable conditions. They want waters that are clear like we want air thats clear, says Burton. But Bay waters are anything but clear. Nutrients, especially nitrogen  from farms, sewage treatment plants, vehicle exhaust, acid rain and your own yard  slide into the Bay like hair down a drain, choking the Bays plant and animal life. Phytoplankton blooms that mushroom at the waters surface are gatekeepers to the waters below. Armed with swords of high-noon rays, sunlight still struggles to slice through to Bay depths. But when light fails, plants starve, oxygen disappears and fish swim for their lives. So what can you do? Try washing your car on grass, make sure gutter and sprinkler water drains into grassy or gravel areas and use the least toxic pesticides  or none at all  on your lawn. A trivial inconvenience for you, but such actions could mean life or death for the many fishes that call the Bay home. Tango should know. He assisted with DNRs striped-bass circle-hook study. Translation: Dont use offset circle hooks. A true circle hooks barb bends back toward the shaft at a 90-degree angle, so it rolls up and out of the esophagus and spins to catch the fish in the mouth, Gary says. Offset circle hooks and traditional J-hooks are more likely to deep-hook the fish and catch such vital organs as the heart or liver. Can you catch more fish using a J-hook? Yes, but youre going to kill more fish. So in the long run its not worth it, Gary says. So bait your circle hooks, and youll encounter fish on future fishing trips. If youre like them, then you already knew what I only recently found out. That the jerk on one end of the line waiting for a jerk on the other end of the line share more than a chance encounter out on the water. You and they have a Bays worth in common. About the Author: Lauren Silver, who grew up in Montgomery County and lived this summer in Calvert County, has been Bay Weeklys full-time summer intern. She now returns to Vanderbilt University in Nashville for her senior year, but she hopes to return to Maryland for law school.